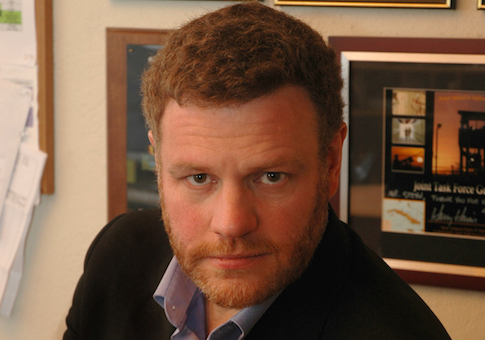 Mark Steyn is tired of the "toilet" D.C. justice system. And he still has a long way to go. More than two years have passed since Penn State University professor Michael Mann filed a defamation lawsuit against Steyn and other conservatives for criticizing his global warming research. At a hearing in the D.C. Court of Appeals on Tuesday, Steyn was just a spectator. He decided not to join his co-defendants National Review, the Competitive Enterprise Institute, and Rand Simberg in filing an appeal to get the lawsuit thrown out. Steyn wants a trial. "I took a decision not to appeal," Steyn told the Washington Free Beacon following the hearing. "The reason is I’ve been in this toilet of D.C. justice long enough and I would like to get onto the trial. If he wants a trial, I take him at his word." "I’ve answered his discovery request, he doesn’t want to answer mine, and I feel at this stage it’s best just to get on with the trial, which he claims to want," he said. "I think it’s absurd." At issue is a blog post Steyn wrote for National Review Online in July 2012 that commented on a post written by Simberg, in which Simberg said Penn State "whitewashed" its investigation into Mann’s work in the same way it investigated convicted child molester Jerry Sandusky. Steyn said he would not have gone that far, but criticized the university for its investigation and Mann as the "the man behind the fraudulent climate-change ‘hockey-stick’ graph, the very ringmaster of the three-ring circus." Mann released his famous hockey stick graph in 1998, which showed global temperatures over the past millennium sharply rising in the 20th century. Environmental activists used the graph as evidence that humans were responsible for global warming. The science behind the hockey stick graph has been questioned since it switches between thermometer readings and tree ring proxy data for the years before 1850, before there were thermometer records. The research was further scrutinized after emails between Mann and Phil Jones, the head of the Climate Research Unit at the University of East Anglia were revealed in 2009, discussing Mann’s "trick" to "hide the decline." "I’ve just completed Mike’s [Dr. Mann’s] Nature trick of adding in the real temps to each series for the last 20 years (i.e. from 1981 onwards) [and] from 1961 for Keith’s to hide the decline," an email from Jones read. The "Climategate" emails were hacked and released shortly before the 2009 climate summit in Copenhagen. Mann, who once threatened to sue over a satirical video, did not respond well to the criticism of his research from Steyn and others. He filed a lawsuit against Steyn, National Review, and CEI in October 2012 for defamation and intentional infliction of emotional distress. "No real scientist asks a court to litigate his science," Steyn said. "Dr. [Frederick] Banting didn’t, Madame Curie didn’t, Einstein didn’t, Sir Isaac Newton didn’t. Real scientists do not look to the District of Columbia Superior Court to decide the merits of their science. Dr. Mann does it because he’s essentially a political activist, a political activist who uses science in service of his activism." The hearing Tuesday was an appeal to a judge denying National Review and CEI’s motion to dismiss the lawsuit under D.C.’s Anti-SLAPP Act, which is designed to prevent costly defamation lawsuits that are destined to fail. National Review’s lawyer Michael A. Carvin argued that "no court in the history of Anglo-American jurisprudence has ever allowed scientific debates to go to a jury," that Mann’s libel claims have no merit, and if the case continues it could set a dangerous precedent for free speech. "Read the Washington Post over the last week when [Charles] Krauthammer accused Obama of committing fraud on the deal with China," Carvin said. "I’ve lost count of how many people have accused Obama of engaging in basic misconduct because of what he did with the executive order [on immigration]." "If this court goes down that road it will be absolutely making all political debates on everything from gun control to voter I.D. turn on what a jury thinks about one person’s view of the evidence," he said. "Because at the bottom of all those debates, is one person saying your view of voter I.D. and voter deterrence is intellectually bogus and a misrepresentation of data." Carvin also argued that it would be impossible for Mann to prove actual malice, since National Review "is sincere in its belief that the hockey stick is ‘intellectually bogus and wrong.’"
"If this were to become the standard there is no First Amendment," Steyn said. "Eventually it will be everything. It might be climate change today, and it might be some guy who’s dragged into court over his views on gay marriage tomorrow, or immigration the day after that." "Eventually what will happen is that you will just have what my counsel calls the chilling effect, which is right, where people self-censor," he said. "People do not discuss topics honestly and do not discuss them on the Internet or in newspapers or on radio or television because they’re afraid that some litigious dweeb like Dr. Mann will drag them into court." "That’s the danger for every—what did they call it today? ‘Sharp-elbowed pundits,’" Steyn added. "For every sharp elbowed blow hard loon like me there’s 999,999 people who decide they don’t want five years in the hell of the D.C. court system and would rather just go silent on it." This entry was posted in Issues and tagged First Amendment. Bookmark the permalink.